Originally posted on Open Society Foundations: Voices. 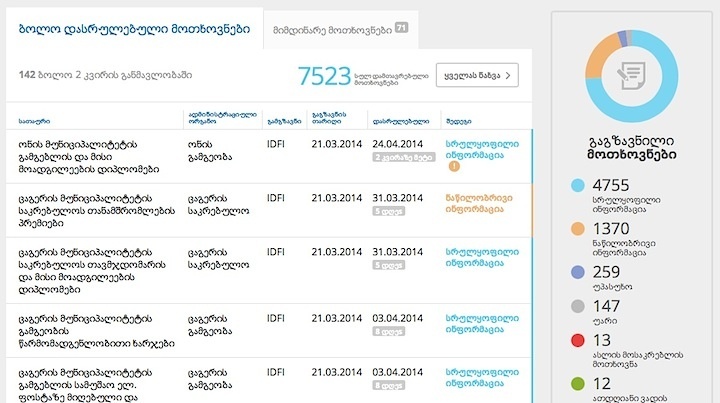 Four Georgian groups also achieved an advocacy milestone this year by unifying their demands for Freedom of Information (FOI). Together, they created the web site OpenData.ge. The story of the site’s evolution offers valuable lessons about the role of technology in NGO strategy and the challenges of capacity development for donors and other experts. The Institute for Development of Freedom of Information (IDFI) posted the first version of the site in 2010, to publicize its FOI requests and allow citizens and journalists to track the replies it got—or did not get—from the government. To widen the impact of their individual FOI requests, Transparency International Georgia and two other groups partnered with IDFI in 2012. They saw a chance for increased impact if they placed all their FOI documents in a single online location. One of the partners, Green Alternative, proposed a model to build leverage for peer organizations. “We thought the information we have could have been used by others for their causes without wasting time and effort,” says Irakli Macharashvili, who leads Green Alternative’s biodiversity program. Sulkhan Saladze is an attorney at the Georgian Young Lawyers Association, which partnered in creating the site. He says the tool offers a picture of not only the compliance but the “behavior” of government offices. The site relaunched as a four-way collaboration in spring 2014. The Open Society Georgia Foundation and the Open Society Information Program funded the overhaul based on several assumptions. One was economy of scale, that groups on a single platform could have greater political impact. Another was that outside technology experts could provide the most suitable tools. In practice, both suppositions have proven true, but the site’s creators and funders have also met with problems that are instructive for open government practitioners. Indeed, policymakers have made several changes in recent years, including new FOI rules, new requirements for proactive information disclosure, and new web tools for transparency. But many changes remain delivered only in part. OGP’s Independent Review Mechanism says that the federal data disclosure site is so far a “compilation of links” to government data sources, not a source on its own. And while IDFI and other groups continue to work closely with Georgian officials on transparency reforms, Iakobidze says the government’s rate of responses to FOI requests is actually falling. A comparison of responses between October 2013 and March 2014 revealed a 14 percent drop in full replies, as well as a 5 percent increase in requests that were ignored altogether. Even though NGOs and international donors are growing more comfortable adding digital tools to core programming (as reports by Open Society and others show), technology projects often face the same challenges as other growth efforts. The Huridocs technology team—based in Geneva and relying on project managers who were also outside Georgia—faced dilemmas beyond the usual challenges of digital capacity development. Next PostWill the Data Revolution Be Well-Advised?